for Anthony Jerone while he was growing up in Flushing. “Give me paw! Bark! Roll over!” were some of his commands. Using food as a reward, he also got the dog to stand on its hind legs. Scout Dog Platoon scouting in the rice paddies of the Mekong Delta and in the mountain jungles of South Vietnam from May, 1969 to May, 1970. Jerone was a specialist fourth class, the equivalent of a corporal. 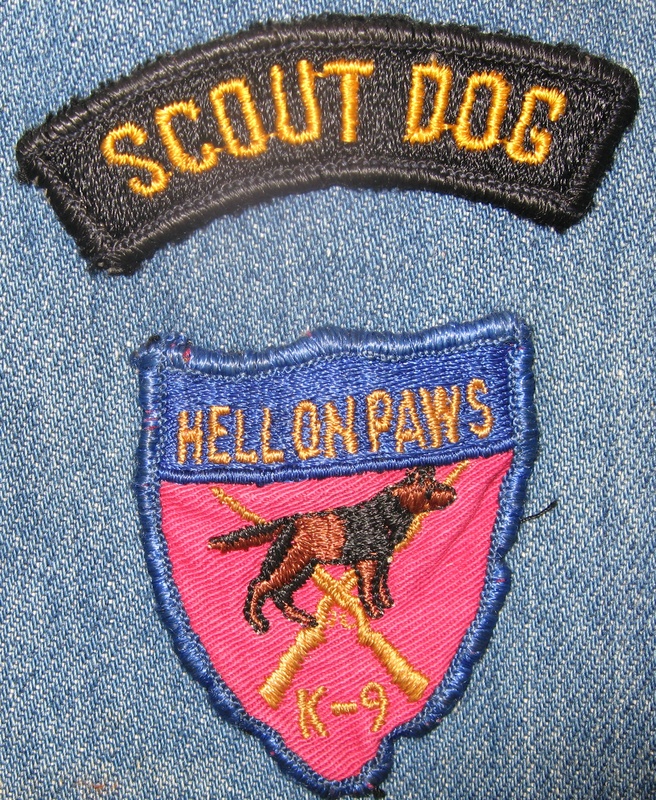 His closest Army buddies were two German shepherd scouts that served with him consecutively, each for six months. The first, Lobo, was trained to detect mines and booby traps, and warn troops of ambushes. The other, Willy, nosed out enemy underground tunnels. For sniffing out a tunnel that led to the capture of a key Vietcong strategist, Willy was promoted from PFC to corporal. 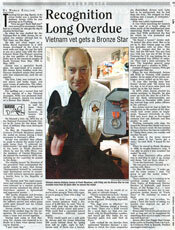 Jerone was awarded a Bronze Star Medal. Jerone had to wait for more than 30 years, however, to receive his medal. the delay. Millions of military files were destroyed in the fire. On May 28, Councilman James Gennaro (D-Fresh Meadows) pinned the medal on Jerone during a brief ceremony in Gennaro’s office. 1973, capitalizing on the expertise he gained in the Army. Jerone credits his own skills and those of his combat dogs for the recognition. He recounted how they became a team and served together. During boot camp at Fort Benning, Ga., Jerone was required to indicate on a form what special training he desired. “Then, it came to the time when you’re either going to ‘Nam with a gun, or you’re going to ‘Nam with a dog,” he said. Lobo, his first scout dog, could scent enemy presence from a distance of 2,100 feet, he said. “You always walk your dog into the wind. The wind carries sound and scent.” Willy could find a concealed tunnel and determine different tunnel depths. booby trap, he would sit at the spot to indicate danger. Lobo worked for six months then contracted “bleeders disease,” a condition in which the white corpuscles are diminished, Jerone said. Lobo had to be euthanized, but he had done his duty. “He stopped us from walking into a couple of ambushes,” Jerone said. It was while searching for tunnels in the sand at a beach about 12 miles south of the demilitarized zone separating North and South Vietnam, that Willy performed the feat for which he was promoted and Jerone honored. “He found a tunnel,” Jerone said. “It looked like plain sand. But as he sat by it, this woman pops up with two grenades with no pins. They [the U.S. troops] shot her in the face, and she fell back. Instead of doggy C-rations, Willy got a hamburger that day. When he was discharged, Jerone left Willy in Vietnam with another soldier. As he spoke of his canine colleague, tears welled up in his eyes. In 1973, when Jerone started his canine academy in Bayside, he also came up with the idea for a K-9 Patrol the Koch administration put into effect in December 1980, teaming trained dogs with police officers in the subways. animals that eat, defecate and bite people,” he said. 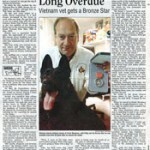 Working constantly with dogs, the longed-for Bronze Star Medal was never far from Jerone’s mind. He has counted almost to the hour the time he waited for it: “Thirty-three years, two months and one day,” he said. When he moved to Fresh Meadows in 1996, he sought Gennaro’s help. “I was able to prove I was awarded the medal,” he said. “I was too emotional,” he said. “He was just so overwhelmed by it”. On May 28, however, “I woke up, and for some reason I said, ‘I’m going to get the medal today,'” Jerone said. his academy the next day to congratulate Jerone, known as “Uncle Tony” or “St. Anthony” to many of them. “I’m glad; it’s long overdue, because I have the honor of seeing my teacher who inspired me, get it,” Giglio said. Jerone offers free Doggie Boot Camps to the public on Sundays from 1 to 4 p.m. in Crocheron Park in Bayside. Pooches are taught to heel and sit.